The Israeli government tightened its Health, Safety and Environment (HSE) regulations so that they now reflect the highest level in this field. 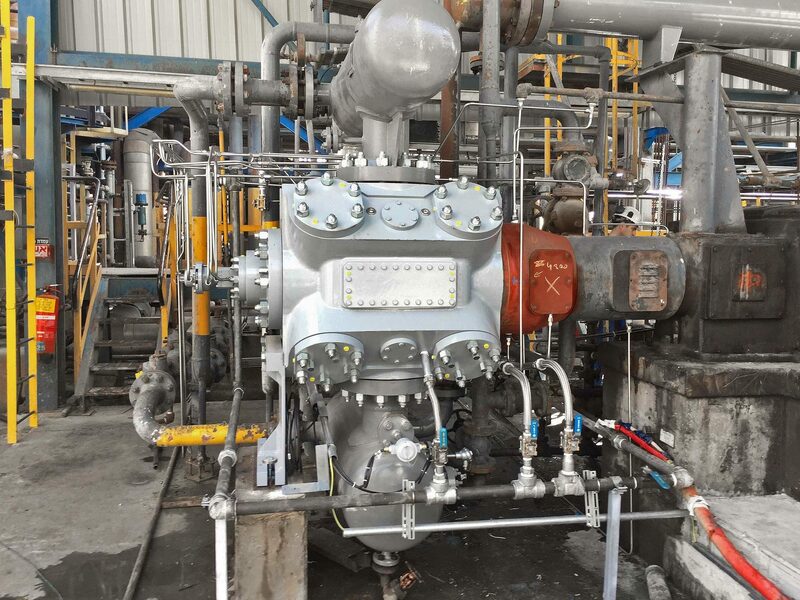 As a result, PAZ Ashdod Refinery had to revamp their existing process gas compressors for hydrogen application in order to be compliant with the new strict HSE standards. 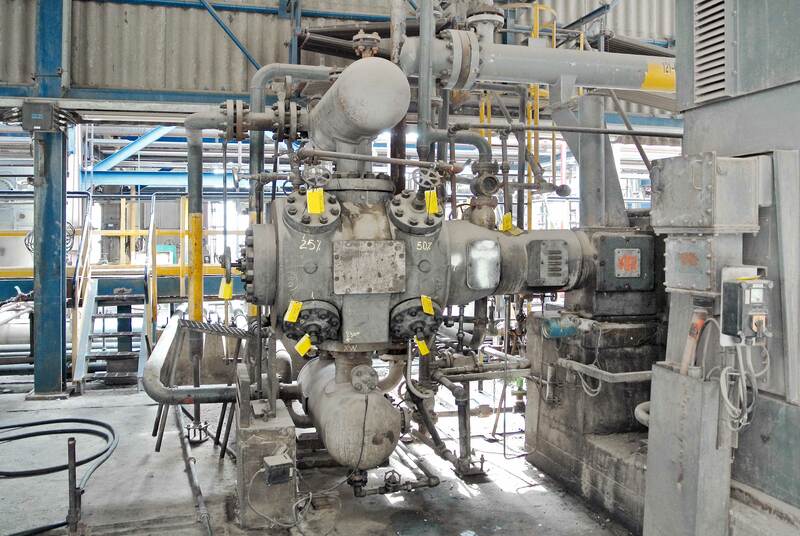 PAZ entrusted Burckhardt Compression to both perform this task and to restore the performance of the compressors of another Original Equipment Manufacturer (OEM). The PAZ Ashdod Refinery is located in the coastal city of Ashdod and is currently the second largest oil refinery in Israel. It operates to the strictest environmental and safety standards while constantly striving to produce high-quality products and investing in improving capabilities and content. 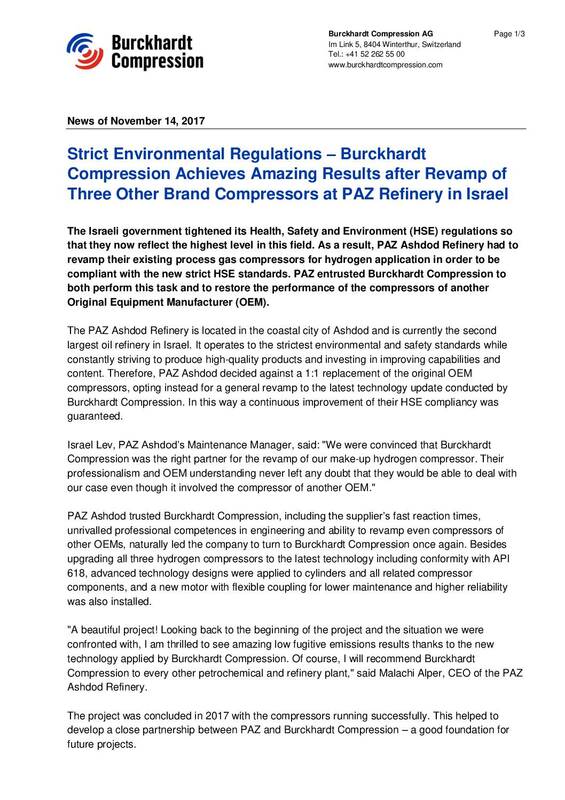 Therefore, PAZ Ashdod decided against a 1:1 replacement of the original OEM compressors, opting instead for a general revamp to the latest technology update conducted by Burckhardt Compression. In this way a continuous improvement of their HSE compliancy was guaranteed. PAZ Ashdod trusted Burckhardt Compression, including the supplier’s fast reaction times, unrivalled professional competences in engineering and ability to revamp even compressors of other OEMs, naturally led the company to turn to Burckhardt Compression once again. Besides upgrading all three hydrogen compressors to the latest technology including conformity with API 618, advanced technology designs were applied to cylinders and all related compressor components, and a new motor with flexible coupling for lower maintenance and higher reliability was also installed. “A beautiful project! Looking back to the beginning of the project and the situation we were confronted with, I am thrilled to see amazing low fugitive emissions results thanks to the new technology applied by Burckhardt Compression. Of course, I will recommend Burckhardt Compression to every other petrochemical and refinery plant,” said Malachi Alper, CEO of the PAZ Ashdod Refinery. The project was concluded in 2017 with the compressors running successfully. This helped to develop a close partnership between PAZ and Burckhardt Compression – a good foundation for future projects. The PAZ Group is Israel’s leading energy corporation and over its 90 years of existence has become one of the economy’s most prominent brands. PAZ supplies a third of Israel’s fuel products and is the country’s first energy company to own a refinery. The PAZ Ashdod Refinery is also connected to the national natural gas distribution grid. The use of natural gas significantly reduces the emission of contaminants to the environment and saves energy costs.